Q: Where did you start in your career after finishing law school? At McDermott Will & Emery, in January of 1976. 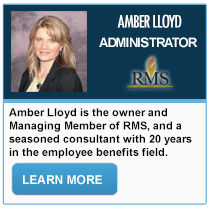 I specialized in employee benefits and executive compensation. ERISA had been passed when I was still in law school, and I knew there was a real opportunity at that time. A lot of big law firms were looking for associates who wanted to do that work; I had an undergraduate degree in economics and finance, and employee benefits and executive compensation really interested me. Q: How did you transition into doing things like ESOP consulting? ESOPs were something that was codified in ERISA, and in my first year of practice, I got involved because there was a thing called a "tax credit employee stock ownership plan." It was based on capital investments made by companies. There was a 10% investment credit allowed to companies, and if they contributed stock equal to 1% to the plan, they could get an additional 1% for a total 11% for the year. No one had done one of these in the practice I was in, they thought it was a great thing to start a young associate on, so that's what I did. When other companies decided they wanted to implement these programs, the assignments went right to me. No one else was really interested in it, so I wasn't competing with other people to get these assignments. I didn't even have to make a case to them, I got assigned it, there was a young partner assigned to supervise the work, and we went off as a team. Q: Who was that partner, do you still work together? I haven't worked with him in years, it was a lawyer named Jerry Fellows. I believe he is retired from practice now. He was a very good employee benefits practitioner. He said to me, "If you do it, I'll edit and supervise it." It was a great relationship. I was still learning a lot of different things in the employee benefits arena, and at the time, every week there was another IRS or Department of Labor interpretation that came out under ERISA, which we were all studying and trying to learn simultaneously; this was one thing that I did that no one else really did do. Q: Did that change over the years? 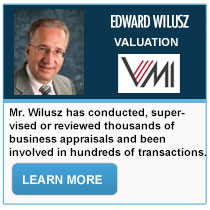 Did the firm gain more customers in the area, because you had become experienced at it? Not at the time, because I was only an associate, I wasn't out writing and speaking on the subject. The firm had big publicly-traded companies that were interested in getting the investment credit, so we helped them get it, and the partners made the clients aware that we could do the work, so there was a fair amount of work. We really didn't see leveraged ESOPs until several years later, maybe 1978 or 79. There were very few, and sometimes we were company counsel or bank lender counsel. Q: How did your specialization affect your career? I left McDermott in June 1980, and I went over to Mayer, Brown & Platt [now known as Mayer Brown]. I was doing some more work in the area, and started to develop a few clients of my own, because I did this work. They were firm clients, but I had responsibility for them, and I brought them to the firm. Q: Have you ever had a private practice? No, I've always been part of a large law firm. 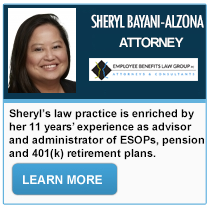 Q: When you joined Mayer Brown, did you primarily have ESOP clients? I was still doing a broad variety of employee benefits work, there still was not a lot of ESOP work at that point. We're talking early 1980s. There was some, but not much. 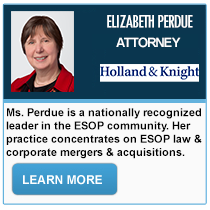 Q: Did your ESOP experience benefit from this position? Some, but it was more at the next position. I left Mayer Brown at the end of 1983, and started at a firm called Keck Mahin & Cate. This began with another associate that I did a lot of work with on real estate limited partnership offerings for employee benefit plans and IRAs. His name was Jim Kaplan, a corporate & securities lawyer. He told me about the ESOP work that his older brother Jerry Kaplan was doing, and I asked him to have Jerry give me a call. Jerry called me in the Fall of 83, and we started talking about me coming over to Keck Mahin & Cate to work on employee benefits as well as work with him on ESOPs. Eventually we came to a meeting of the minds, and I left Mayer Brown and came to Keck Mahin & Cate as a partner. At that time, I was chairing the employee benefits practice, and working with Jerry on ESOPs. Several months later, in early 1984, Marilyn Marchetti, who had been working with me at Mayer Brown, came over to work with Jerry and I.
Keck no longer exists, but at one time we had a big, national ESOP practice. By mid-year of 1984, all three of us - Marilyn, Jerry and I - were at Keck. Q: At that time, all 3 of you had ESOP experience, but were in a minority, since ESOPs were still not that common a practice? The only boutique ESOP firm that existed at that time was Ludwig & Curtis, which was Ron Ludwig and Jack Curtis, and they were out in San Francisco. We built up the practice from that point. The first big thing that happened was that the Tax Reform Act of 1984 was enacted, and that included the Section 1042 income tax deferrals, it included some special deduction limitations for ESOPs, and it included a 50% exclusion from income tax for interest paid on ESOP loans in order to get banks interested in making ESOP loans. It also included some special estate tax incentives, where if an estate sold shares to an ESOP, they got special breaks. That was a big deal. In the middle of that year, within a week of that enactment, Jerry, Marilyn and I did a seminar for all the big lender banks in Chicago in order to inform them about it. We were all partners at Keck at that point. It was a tremendous boon to business. Of course, we also approached our corporate clients to tell them about this, particularly the Section 1042 tax deferral, that helped. We really got going and did quite a bit of business by the end of '84 and certainly into '85. Q: The new business that developed, did it consist of companies that were converting their benefit plans to ESOPs? Yes. 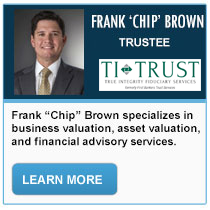 In various transactions, we were representing the companies that were adopting and sponsoring the ESOPs, or the lender banks, and in some cases, we were representing the independent trustees. Q: Are there conflicts you have to worry about when you represent so many different parties? Well, we only represented one party in a particular transaction. So when we represented a lender bank, we wouldn't represent any other party in the transaction. Q: Can you share any stories about Jerry Kaplan? I can tell you outright that one of the first things that we did was to work with Ron Ludwig to put together a tax management portfolio on ESOPs for the Bureau of National Affairs. 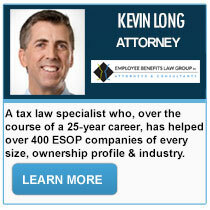 They do management portfolios on a broad variety of tax and employee benefits subjects, and we did one on ESOPs. This was a bridge to Ron for us, and we started referring work back and forth with Ron. Q: Was it because of geography, since Ron was on the East Coast and you were in Chicago? In part, but we were all practicing all over the country - we were working with companies in Texas, the East Coast, the West Coast, and we wanted someone to work with who we knew was good and who we could trust, and that was Ron. Very smart, very good technically. If we represented a company, and if we wanted to make sure we had a good lawyer representing the trustee or the lender, we would push hard to have him retained, because we wanted to get the transaction done properly. Jerry did a wonderful job, he knew everyone in the community. He was very good at introducing both Marilyn and I into the community, so that, within a very short period, we knew most of the people in the community. We were attending meetings of The ESOP Association, the National Center for Employee Ownership, (which Corey Rosen was running at the time), and meeting all the other people in the ESOP world in which we are now living, and it was fun. Q: Any interesting anecdotes about any of those meetings? I remember the first meeting I went to, it was in 1984. Luis Granados was the executive director of the ESOP Association at the time, and the very first session that Jerry and I went to was to listen to Louis Kelso talk about ESOPs and, in particular, the new ESOP at Wierton Steel. We introduced ourselves afterward, and that's when I first met Louis and a lot of other people in the community. Q: What did you think of Louis Kelso? Interesting man, a real ideologue. He was really into it, a real believer. I read his book, the Capitalist Manifesto; I thought it was a very good idea, and I thought it would help America, I didn't necessarily think it was going to save America, but believed it had solid application to certain companies. He felt the way he felt, he was very fervent and passionate about it, no question. And he was very knowledgeable. He had just completed a big deal, the Weirton Steel deal in West Virginia, which prevented a shut down. The deal saved a lot of jobs, it was a big cause célèbre. Q: There are some people who are really into the ideals of ESOP; Jerry and I, on the other hand, wasn't. Where are you on the spectrum? Jerry and I had a real heart-to-heart conversation, and agreed that while we both believed in this concept, and that it is beneficial to our clients and their employees and so forth, we couldn't afford to be seen as ideologues or advocates, because we're counselors. We have to be seen as neutral, and independent, and able to counsel our clients as to what's good about ESOPs, what's not so good about ESOPs, why it might work for them and why it might not work for them. It was a conscious decision we made. We informed our clients that we've worked with other clients, it's worked very well for them, and here's what the results were, and for those other clients it didn't work so well, and what we saw as the causes of their specific outcomes. We felt it was very necessary that we be seen as independent advisors rather than advocates. There were plenty of other advocates, the world didn't need more advocates - what it needed was counselors who clients could depend on for independent advice. We were at a large law firm, where, if we were counseling our client on ownership succession, we would talk to them about all the possibilities, including ESOPs. At the end of the day, we didn't care if they did an IPO, sold to a third party, went through a merger, a generational transfer, or did an ESOP, because our firm could do whatever they wanted. Q: What were some of the challenges you faced in developing materials and practices, and presenting them to clients? We tried to develop materials for our clients so they could self-educate. We didn't have websites in those days, so we were putting together a lot more hard-copy materials of frequently asked questions about ESOPs, descriptions of tax effects, discussions about fiduciary behavior and about dealing with lenders in ESOP transactions. We even did a short 20-30 minute video about the transaction process, from the beginning of the deal to closing. We used lawyers from the firm, and we were all very bad actors. We did it as an anecdote from start to finish, for a fictional company. It was very useful at the time. We also reached out and spoke around the country, found lawyers in other locations to join the practice. Over time, Luis Granados and Lou Diamond joined the firm in Washington DC, Jack Curtis joined us in San Francisco, Roland Attenborough joined us in Los Angeles and Mike Abbott joined us in Houston. Q: What were some of your proud moments in ESOP work? One proud moment was a transaction we all worked on for Lyon Metal Products, a company which probably made your high school locker. It was a small-cap publicly traded company that had Irwin Jacobs, a reputed corporate raider at the time pursuing it, but Lyon also had a lawsuit over the termination of an overfunded defined benefit pension plan for its salaried employees. We got involved working with a litigation attorney, Myron Cherry, who was representing the salaried pension employees in the plan surplus lawsuit. We finally got that case settled by having the surplus transferred over to be the seed money for an ESOP. Plus, the company borrowed money from American National Bank and re-loaned it to the ESOP, and closed a going private transaction. It was a lot of balancing between Irwin Jacobs, the company, the employees, the trustee (Citizens and Southern Bank and Trust Company) and the lender. It was a very difficult transaction to get done, but it got done, I believe, in August 1986. We all had different roles in it, Marilyn Marchetti and I dealt with the federal agencies, initially the Pension Benefit Guaranty Corporation to allow this surplus to be transferred over to an ESOP, and with the Department of Labor about its concerns about how we were going to do it. After Lyon engaged the independent trustee with a separate lawyer and separate financial advisor, we dealt with the IRS on some very technical IRS issues. Jerry worked with the lender bank and organized a disclosure memorandum to the shareholders and worked with company counsel. Marilyn and I were working on getting a lot of the more technical ESOP pieces together. It really was a team effort. That was about a year and a half of work. Q: Can you share a story of how you helped a client achieve an "Aha!" moment of understanding about what an ESOP could do for them? Yes. It's probably different from the ones you've heard by now. My wife, Joy Feinberg, is a divorce practitioner, and a very good one, here in Chicago. She had a client who owned a second or third generation family business and was getting a divorce. The particular divorce estate had a high value but was relatively illiquid, and one way we figured out to solve this divorce and to get money to the about-to-be-ex-wife was to do an ESOP. Joy called me in, and we talked to her client, and said, "Would you rather have your ex-wife as your minority partner after the divorce, or would you rather have your employees?" And he said, "That's an easy one, but how do I get there?" We explained to him what an ESOP was, and the tax effects of a transfer of a 30% interest in the company to his wife, on the condition that she immediately resell it to the ESOP at fair market value. Both transactions were to be tax-deferred, so we could get 100 cents on the dollar to the wife, get her cash, and get her completely out of the business. What's more, we told him that on the sale of the stock, we would have an independent fiduciary represent the ESOP, and they would negotiate with his wife's attorney instead of him, and he really liked that idea. 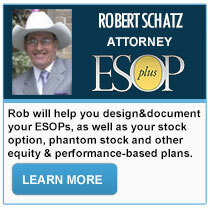 He really had no prior idea of how an ESOP could help him with his divorce. He'd heard of ESOPs. 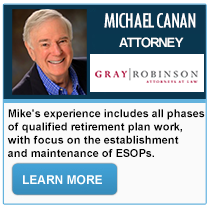 I've probably done about five or six ESOPs in divorce over time; it's not something you do every day. Q: Can you share a story about interacting with clients that shows how a skilled advisor should handle themselves? We had a deal where we were working with Steve Hartman, who is now at GreatBanc, but years ago was at another bank, Marine Midland Bank. We were selling an employee-owned company for all cash to a publicly-traded company that was represented by a very prestigious law firm. The lawyer on this case was extremely difficult and loved to come up with last-minute surprises. We finally worked through all of the details of the transaction, got everything negotiated, and were ready to close the deal. I warned Steve that there were going to be some last-minute things, I did not know what it would be, but this lawyer was going to come up with some last-minute off-the-wall tactics, so just be prepared for it. Steve was indeed ready, and as we came in, and sat down, the lawyer said, "There are three things that we have to talk about before we can close this transaction, and they're extremely important to my client." Steve replied, "OK, what are they?" After the lawyer described the three things, Steve said, "Those are interesting, I thought that we already negotiated those points, but I couldn't possibly decide these issues here and now because I don't have the authority to decide these big issues to the deal that have real economic impact. I'll have to go back and meet with my fiduciary committee; I can probably schedule that someday next week, and then we can reconvene our closing," he said, knowing full well that the company wanted to close the deal that day. Then he handed the lawyer his airline ticket and asked, "Could you have your secretary get a different return flight for me, so I can fly back, because obviously we can't close this thing today?" We closed it that day. All three issues went away immediately. We knew that they needed to close it that day, because they wanted to consolidate this acquisition onto their financials for that fiscal quarter. I had the client ready for it, and he shut the lawyer down beautifully. It was a masterful response by Steve Hartman, because we couldn't predict beforehand what the lawyer was going to come up with. I had to keep from laughing. The lesson here is, have your client prepared, so the client doesn't get caught off-guard by the behavior of the other attorney. We all knew the lawyer was going to do something, we just didn't know what it was. Q: What advice would you give to a new advisor who's thinking about specializing in ESOPs? Go to as many conferences as you can, learn as much as you can, read all the materials that are distributed, talk to as many different professionals - not just lawyers, but trustees, ESOP valuation experts, plan administrators, record-keeping firms - to take in much as you can from all the people, because there's so much to learn. Self-education is important, but you need to be part of the process, and you need to be communicating and learning from other people. Everybody has a different perspective on ESOPs. And you need to talk to the ESOP banks, you need to understand how the banks look at these loans, how they approach them, because you can't look at any of this subject in a vacuum; you need to see how other people see it. You can learn all the black-letter law in the statutes and the regulations, but until you understand the context, it doesn't mean anything. It's quite an education process, and you really have to go in and manage it for yourself.